Innovative auto feed system for automatic shredding of paper stacks with up to 150 sheets of paper (A4, 80 g/m2). Manual feeding of up to 6 sheets at a time. Convenient control panel with LED indications for the operational status and push buttons for forward / stop / reverse. Auto start and stop via a photo cell. Automatic disconnetion of power supply in EcoMode. Quiet, powerful and energy-efficient motor. Separate cutting unit for CDs/DVDs/plastic cards. Safe operation provided by a comprehensive safety package. Elegant shred bin, removable to the front, with large window showing fill level. 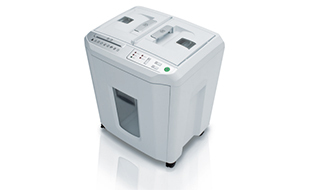 High shred bin volume of 30 litres. Automatic stop if the shred bin is full. Second bin for CDs/DVDs/plastic cards allows easy waste separation. Mobile on castors. Interested in the ECO 8280C?